Further engineering work on the München - Salzburg line resulted in the diversion of some EC trains for five days in October 2014. Only a handful of services were diverted each day, far fewer than the previous year, but the weather was appalling with very little sun. This was the only well lit shot I got during four days in the area. 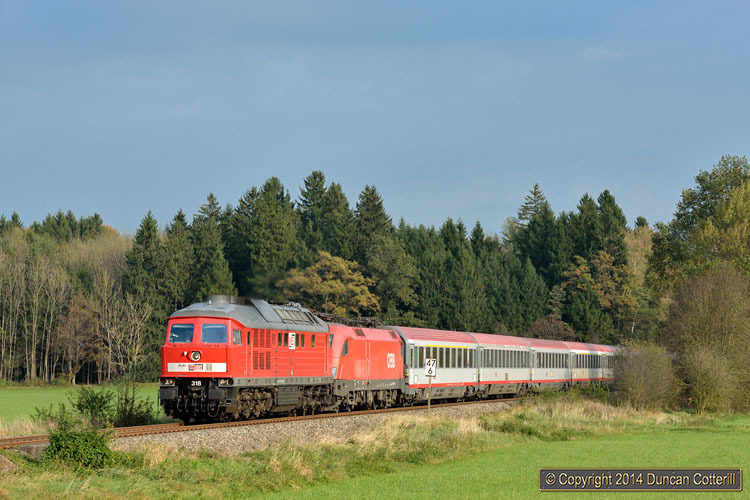 232.690, aka MEG318, emerged from the woods south of Kirchanschöring with 1116.147 and EC112, the 10:27 Klagenfurt - Frankfurt EuroCity, on the afternoon of 29 October 2014, the final day of the diversions.